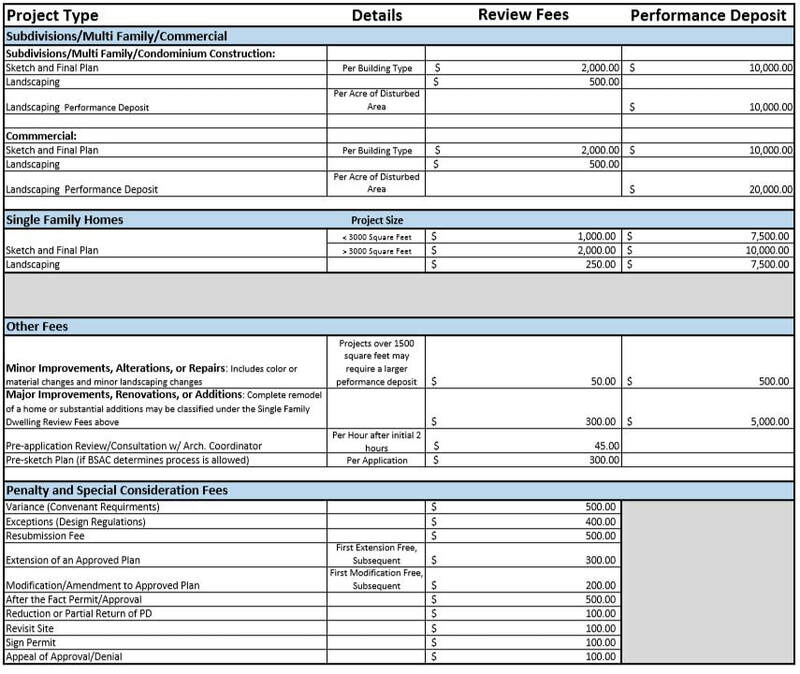 With input from the BSAC, the BSOA Board has recently approved the following modifications to the Architectural Review Fee Schedule for BSOA construction projects. The intent for these modifications is multi-purpose: to encourage efficiency with project application submissions and discourage the practice of bringing projects multiple time for BSAC review. The goal is to reduce the amount of work for the Architectural Review Coordinator and Committee volunteers, as well as provide additional funding to support costs incurred for repetitious requests made to review a construction project. ​Depending on your project, review fees and performance deposits must be posted before construction or work on your property can begin. Review Fees are non-refundable and are paid when the project application is submitted. Review fees offset BSAC expenses and must be paid in cash or check prior to your project being placed on the BSAC agenda. Performance Deposits must be in the form of cash, or check and must be paid after your project is approved by the BSAC but before any type of site-work begins. The Performance Deposit is refundable at the conclusion of the project if your project is substantially completed on-time and in compliance with the approved plans.